Live a fairytale: stay in a 14th century Bavarian Castle, then in storybook villages along the Rhine River! One week each in personally selected apartments in a medieval castle in Bavaria and in the Middle Rhine area. Airport transfer info: Detailed instructions for your rental car pick-up and independent drive to the castle. Orientation sessions with our local hosts in each destination, to help you settle in and plan your time. Castle: A 7-day car rental. Rhine: 7-day German Rail Pass, for unlimited travel on the German rail system and a 20% discount on KD German Rhine boats. Transfer between destinations: Drive to Frankfurt airport using our detailed directions, return rental car, and train to your German Rhine village using your rail pass, with assistance upon your arrival. 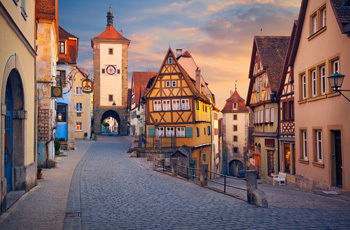 Local info, driving map, and Untouring Bavaria and Untouring the Rhineland guidebooks, both researched and written by Untours staff, full of insider tips and sightseeing suggestions. Cultural events in each location, like a castle tour with the Baron and a guided trip to a wine museum, a wine tasting, or a dinner.